Branko Stamenković, LL.M, Special Public Prosecutor for High-Tech Crime and Elected Member of State Prosecutorial Council is leading Public Prosecutor in Republic of Serbia and region of Western Balkans for High-Tech and Internet related crime cases. He is the author of the National Center for High-Tech Crime Combating project and draft law about Special Authorities for Cyber Crime combating in Serbia which resulted in adoption of the Law on Organization and Jurisdiction of State Authorities for High-Tech Crime Combating. His background includes studies and trainings in the fields of Information Technologies and Global Networking Criminality together with Contemporary Business and Organization of IT, International Bar Association and Humanitarian Law Fund specialization in the field of International Humanitarian Law. He is also a co-author of „Terrorism and organized crime, challenges for was expert lecturer for Council of Europe and European Union project „PACO Serbia“. 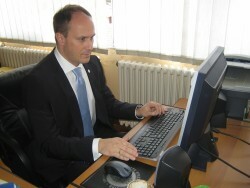 in the field of combating economic and cyber-crime in Republic of Serbia. Member of several Government Authorities and Task Forces regarding combating and preventing Cyber Crime and actively involved in EU IPA projects regarding ICT Public Prosecution systems. He has been elected by the T-CY Committee of Council of Europe’s Budapest Convention on Cyber-Crime for the T-CY Bureau Member during the most recent session in June 2012.